I’m not sure about you but I find December really challenging – not because I don’t like Christmas – in fact, I think it’s because I LOVE it so much that I am so determined to make it so special for everyone – often at a detriment to me. Before I had kids and before postnatal depression hit me, I had no idea about mental health and also how to keep myself well. I know now that I am much more susceptible to becoming ill but I also know now that I have the power to keeping myself well. I finally have a really good wellness strategy in place that’s working. This is vital in times where I feel particularly stressed and I know that Christmas and December is one of those times. So here’s my wellness strategy that I’ve been putting into place – all with various levels of success but I’m definitely feeling much better and I hope that by sharing this and my own strategies for wellness, that you can find something here that’s helpful for you. Eating well – it’s easy to end up eating really rubbish food – and whilst that might satisfy an immediate need – it often ends up making me feel worse – so I’ve been really focusing on eating well and particularly eating a better breakfast filled with protein (success rate – about 80% – not bad for me!). Silence – I need silence – it’s not a want or would like – I need silence in my life so I can think uninterrupted, follow a thought to a conclusion and really enjoy peace – so I’ve been upping as much of this as I can – not easy when you have three boys, an eeking cat, busy with work and life but so far – I’ve been observing when I’m not getting it and making time for this (success rate – 60-70%). Gym – this week I was dealing with ill children, the dip after a birthday, being away in London and not having a moment to myself. Even though I had a sick child at home, I said to poor Mr Murray – you have a choice – either I go to the gym or I lose my sh*t – and what a release I felt for going – I needed to get hot and sweaty, listen to pounding techno and put away the rest of the world for that 40 minutes. I need my yoga and gym (thank you mr banantyne) (success rate this week – 100%, last week 0% due to ill children). Friends – and not on social media. My best friend popped in yesterday afternoon for a cuppa. Friends are priceless – especially good friends that make the time for you even if you don’t get to spend as much time as you want with them (success rate at spending time with people who make me feel great – 100% this week). EFT – I absolutely have to include that – I love doing EFT with clients as there’s always borrowed benefits but this month I’ve been doing swaps with another practitioner and I’ve found it so massively beneficial – so that’s something going forward I will be totally increasing with trying to book in a monthly EFT session all just for me – it’s such an amazing/great/fantastic/brilliant therapy and can be used for so many thing. I do frequently use it on my own but rarely for more than 5-10 minutes so it’s this amazing gift to have that time to do it with someone else. (Success rate – 100% – I’ve had two sessions in the last two weeks so going to score myself at the max). Learning to say no – I’ve cancelled so many things in the last few weeks and really thought about everything – do I want to do that, is there a necessity that I do this, what can I do to clear time for me – what a massive release and also given me time for silence or gym or catching up (success rate -50% ). Leaving it till tomorrow – not worrying if I can’t do something right away – emails, messages, people can wait. And equally releasing that expectation from others that they must reply immediately. (success rate – 40%). Sleep – focusing on getting better sleep – sleep for me is essential – so if that means 9pm bedtimes – so be it (success rate – 50%). Watching some great films – for me films have always been my escapism and I’ve been obsessed with films for years – in fact, out of all the things that I miss in life before having kids it was the weekly trip to the cinema – I miss Orange Wednesdays!!!! (success rate – 75% – I’ve been to see Fantastic Beasts, finally watched Amy last week, Arthur Christmas and planning to see Rogue 1 this weekend). So what works for you? 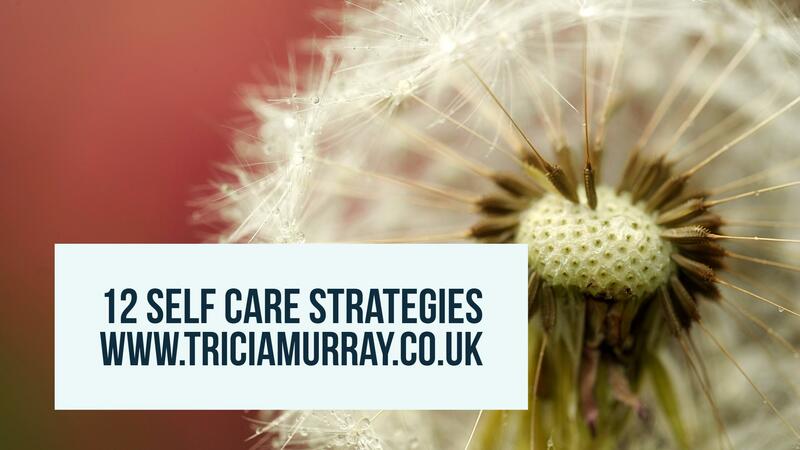 What self-care strategy do you have in place? Can you see the wood from the trees? Have you worked out what keeps you well? What strategies can you put in place to KEEP you well? Keeping you well is one of the least selfish things you can do – self-care is so vital – after all, we all know the saying – you can’ pour from an empty cup. If you’re a new parent and struggling you can get support specific new parent support here or here for all parents and for anyone else, click here. If you have any questions from this, do get in touch.